When I was reading the book, An experiment in Education by Sybil Marshal, I felt the urge to make social sciences enjoyable and exploratory. As the year had just begun and I was getting to know the children, I parked this thought with the hope that I would find my inspiration very soon. Teaching geography to children in the age group of 8-10 is a challenge in itself. The geography prescribed for grade 4 is India and the states with its varied landforms, climate, vegetation, and the way of life of the people. This topic can sometimes get dull and boring for the children and the teacher when restricted to the classrooms and a pedestrian approach is followed. I also found it daunting to explain concepts like perennial and seasonal rivers, irrigation, terraced farms, peninsula, etc. By the end of the academic year it dawned on me that what I needed to do was a large model of India with the states of India as individual parts of a jigsaw puzzle. This would help children understand India as a landmass and the directions of East, West, North, and South better. They could also depict the states with their specific geographical features. I initially thought of putting together eight or nine chart papers and drawing the outline and the states. But then I realized that getting the correct dimensions of the country and the states was equally important and no distortion on this count could be allowed. A team of cartographers were engaged who gave us an 18ft/14ft map of India with the various states as parts of a jigsaw puzzle. The seven sisters however, was a single piece and Goa was identified along with Karnataka. The map was printed on a flexi sheet. The sheet was then mounted on thin thermocol slabs. On seeing the map take this physical shape, the excitement in the school office was palpable. The two sections of grade 4 had a total of 49 children. One child from each section was paired and assigned to work on one state. One period of 40 minutes every day was dedicated to this project. The resources the children had access to was the Primary School Atlas and the prescribed geography textbook. The other resources that the children used were Open Sesame, and India, the Land and its People. I was very clear that the children could access any other books from the library but that they were not to use the Internet. Initially, the children were given the task of generating ideas for their respective states. For e.g., Kashmir could be depicted by the Himalayas, Shikhara, Pashmina Sheep, etc. Team Kerala wanted to depict a boat on the backwater, crops grown, Kathakali, and coconut trees. I wanted to make sure that every idea given by the children was grasped so that learning becomes more active, interesting, and easily assimilated. The groups worked on their states separately. 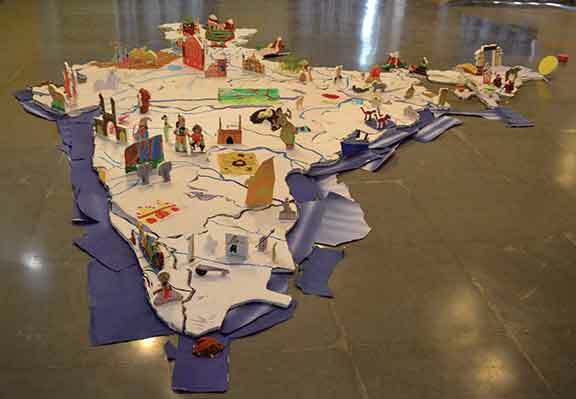 During this phase of the project, the children were all sprawled on the floor with their respective cut out of the map. They were trying to figure out the dimensions of the miniature models of thermocol that they were creating. The two class teachers in the meanwhile had to research for ideas on the newer states like Jharkhand, Chattisgarh, and Uttarakhand. The seven sisters too needed some research. My fellow teacher chanced upon a magazine called MARG which had detailed descriptions and colourful photographs of the North East. Very soon the whole region came alive with Manipuri dancers, bamboo baskets, house on stilts, Tawang pass, bamboo and banana forests, and the rising sun at Arunachal Pradesh. Terraced farms were being cut out from thermocol sheets, mountains were rising from papier mache, drawings of lions of Gir, Royal Bengal tiger and one horned rhino of Kaziranga were all standing upright to find their rightful place on the map. For sure, the power of creativity had been unleashed! Suddenly the class was revived with freshness and creativity. The project began by showing the various landforms and water bodies like mountains, rivers, lakes, beaches, soils of various regions like black soil and red soil and crops like wheat, cashew, cardamom, and sunflower. There was a new found awareness that art and craft could be used to learn geography. This led us to many new ideas. The children decided that they would depict not only the geographical features but also historical monuments, dance forms of various states, handicrafts, musical instruments used in the north and south like the mridangam and the tabla too found their positions on the map. There were some slow starters to this activity. But they too were observing and absorbing the scenes. Once the individual states were ready, we had to piece them together at one place. As the models were being assembled one by one by the respective groups there was a sense of pride in their creation. Slowly the country, which till then was just a map in a book, blossomed and came alive. My job was to stimulate interest for geography and turn this information subject into an art. This activity has made an indelible impression of the geographical positions of the various states of India and the rivers that flow through these states. The children now discovered the diversity of culture and variety of traditions of this landmass which they had put together. I would say that this project was a fitting climax to the social science class of grade 4. Acknowledgements: Special thanks to MR Srinivas and his enthusiastic team of cartographers at Orient BlackSwan. The author teaches geography at Vidyaranya school, Hyderabad. She can be reached at pradita_n@yahoo.com.